Know someone who might be interested or able to support? Forward this email their way and help spread the word. Won't you join in? Here comes a great opportunity to earn perpetual rewards - from now until the day of judgment. The opportunity is here to build a New Masjid and Community Center in a vibrant city in the heart of Atlanta, called Clarkston. Assisted by Settlement Agencies and various NGOs, Clarkston has been very generous in receiving refugees from various war torn countries of the world enabling them to start their lives anew in the Clarkston area. Refugees come to Clarkston. Stay a while. Jumpstart their lives. A good number moves out. Some stay in Clarkston and the vicinity. The story repeats. Afghans were some of the first groups in the early 80's to call Clarkston their home away from home. Then came the Iraqis. The Kurds followed. Then the Bosnians. The Kosovars. The Somalians. The Ethiopians. And, as of recent, the Burmese. However, the one constant in this ever evolving story of migrants moving into and out of Clarkston remains: Masjid Al-Momineen. Masjid Al-Momineen has served immigrant Muslims for the past 27+ years - ever since it was founded by the first wave of Afghan refugees to the city. The current community of Muslims in Clarkston has decided to replace the existing structure. It is high time to construct a larger facility. The existing main prayer building is expensive to repair and maintain. It will make for a much better long term investment to construct a new building than to keep repairing the existing 120+ year old structure. With apparently never ending conflicts in Africa and Middle East, it is inevitable that Clarkston will see another large influx of refugees this year and in the years to come. Regular prayer attendance is already the highest among all Metro Atlanta mosques. The facility does not have the capacity to accommodate Friday attendance at all. Hundreds have to pray outside even during inclement weather. Then there are other reasons beyond maintenance and capacity. The community is in dire need of space for fitness and job training, SAT preparation classes, ESL programs, inter-faith and youth development programs. Clarkston and Masjid Al-Momineen welcome Muslim immigrants to the area as ever before. However, we need to upgrade the facility and make this Masjid more welcoming and accommodating. Our vision is that Masjid Al-Momineen should be a complete community center - not just a place of worship. It should serve as many needs of a typical refugee family as possible. It should have dedicated facilities and suitable programs to empower this and successive waves of new Muslim residents in Atlanta to succeed with their new lives. The new facility's architectural plans have been submitted to DeKalb County and the required permits are in the process of being issued. $400,000 has been raised. A capacious and beautiful parking lot has already been built. The sewage system has been completed. We are ready to embark upon this noble project as early as this spring, inSha'Allah. 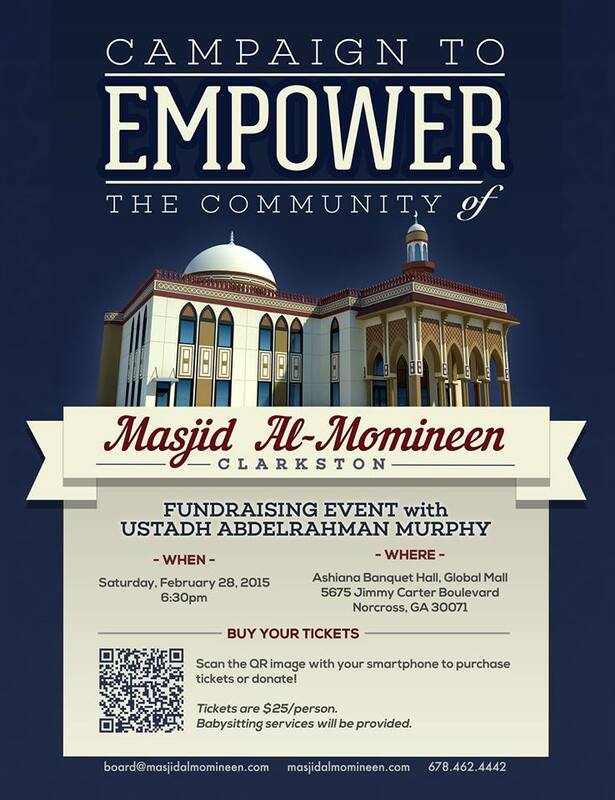 You will certainly wish to play your part in building of a new community center and house of worship for Allah Almighty in the city of Clarkston. A city with a grand outlook for growth and revival. A city that stands at the cross-roads of I-285 and 78. A new house of worship that will be environmentally friendly and that will serve as an architectural landmark. What a nice pairing! 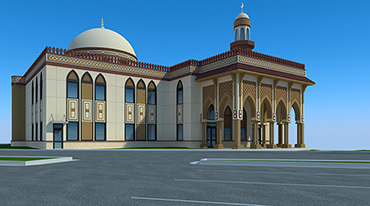 A Masjid for the future in an ambitious city that is aiming to revive and modernize. We want to showcase our plans and the project to you and your family. AbdelRahman Murphy is the invited keynote speaker. We would like to give a progress report of our past projects - all leading to this junction, this junction in time when we as a united community in Atlanta participate in the building of not just another place of worship for our Lord and Maker, but also a Muslim community center of the future. The biggest challenge of our time is to train the next generation of Muslims in Atlanta on how to become better citizens and proactively contributing members of a society where the name Muslim will once again become synonymous with all that is perceived as good and noble. Buy your tickets online now. Full babysitting services will be provided. Bring your entire family. Enjoy a full buffet of delicacies and listen to the young but renowned AbdelRahman Murphy's inspiring address. Not interested anymore? Unsubscribe by responding to this email with subject line of Unsubscribe. 837 N. Indian Creek Dr.